T-Mobile’s list of LTE-ready devices grows yet again this morning with the official announcement of the BlackBerry Q10 availability. T-Mobile announced the device back on April 24th with the registration page going live for business customers on April 30th. Fast-forward to May 14th and we’ve finally got something a little more concrete from the UNcarrier. Beginning today, business customers can work with their B2B reps and purchase the Q10 for $119 with qualifying rate plans. Consumer customers on T-Mobile can expect to pick up the Q10 sometime in June for $99.99 down with 24 monthly payments of $20 each. The Q10 will be available through T-Mobile’s company-owned retail stores, T-Mobile.com, select dealers and national retail stores. The registration page is now live for T-Mobile’s consumer customers at http://explore.t-mobile.com/blackberry-q10. Today, business customers can work directly with their B2B sales rep to order their BlackBerry Q10. Pricing for business customers begins at $119.99 with qualifying plans. The BlackBerry Q10 is expected to be available for T-Mobile consumer customers in June for $99.99 down with 24 equal monthly payments of $20 for well-qualified buyers for 0% APR O.A.C. The smartphone will be available in T-Mobile retail stores, via www.T-Mobile.com and through select dealers and national retail stores. 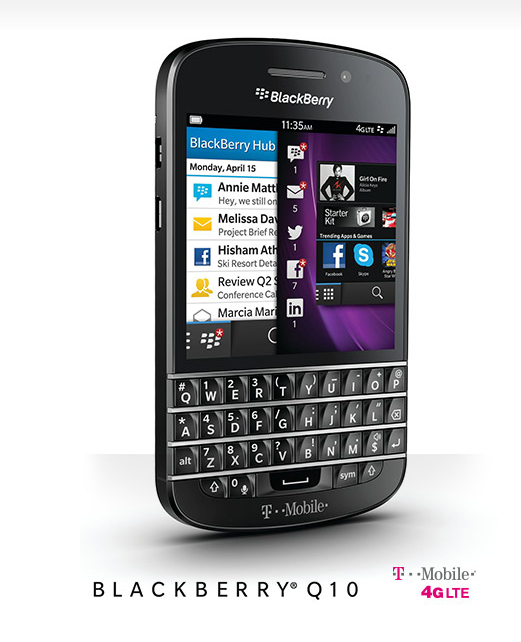 Consumer customers interested in the Q10 can register at http://explore.t-mobile.com/blackberry-q10. The new smartphone combines features BlackBerry is known for – the BlackBerry QWERTY keyboard and security – with a 3.1” touch screen, the power of the BlackBerry 10 platform and 4G LTE and HD Voice capabilities for a premium customer experience. BlackBerry® Hub helps manage personal and professional conversations, BBM™ messages, social media updates, or notifications with the ability to “peek” into the Hub from anywhere. To learn more about features and capabilities, visit the BlackBerry Q10 media kit. For consumer and small business customers, T-Mobile’s Simple Choice or Simple Choice for Business Plans allow customers to design their plan based on the number of lines and amount of high-speed data required. There are no caps and no overages, and no restrictive annual service contracts. To provide added value for small business customers, T-Mobile’s Business Extras bundle allows customers with capable devices to access business-focused capabilities or solutions, like 24/7 remote IT support and paper-to-mobile forms conversion, valued at more than $400 for free. More information about T-Mobile’s Simple Choice and Simple Choice for Business plans can be found at http://explore.t-mobile.com/whyt-mobile and http://business.t-mobile.com/small-business. More information about T-Mobile’s Business Extras can also be found at http://business.t-mobile.com/small-business. That is a big price tag for BB phone. $15 a month might have been better. How do BB plan to compete if they price their devices same as Android ones (or iphone for 50 dollars more). Not sure if BB set the price, or TMobile did. Either way, I would think that the price that BB sold the device to Tmobile would have to be high enough for 99 + (24x 20) price!! Why not release it to everyone else Tmo? Didn’t they do this with the Z10? All rumors I had heard about the Q10 was set for June so this seems to be inline with that. But they need to release it to everyone else. I think I’ll have to use my business name. Do you know of the advantage vs disadvantage for a personal vs business account? Woah, it has a keyboard! I’ve never had a phone with a keyboard, but for whatever reason, some of my coworkers just love having one. Not too many of those on the market anymore, but I bet there are enough people who still want one that they’ll actually sell some of these.